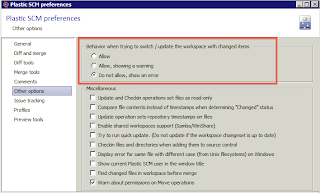 Plastic SCM blog: Plastic SCM 4.1.10.397 is out!!! Plastic SCM 4.1.10.397 is out!!! Reading Plastic SCM releases notes you are the first to know what’s new with upcoming releases. Now, we present Plastic SCM 4.1.10.397 release or “Tanger” release is the alternative name. A new release kindly delivered!! You may also want to check out all release notes. You can find them here. Remind, download the latest Plastic SCM version from our web page. The new updates for Plastic SCM enhance the most relevant new features and bug fixes. The biggest added, in my opinion is this: Mylyn for Eclipse is included in the Plastic SCM installer. You can grab it now from Plastic SCM download page. For an up-to-date list of the third-party products and versions supported, please consult our third-party tools compatibility matrix page. 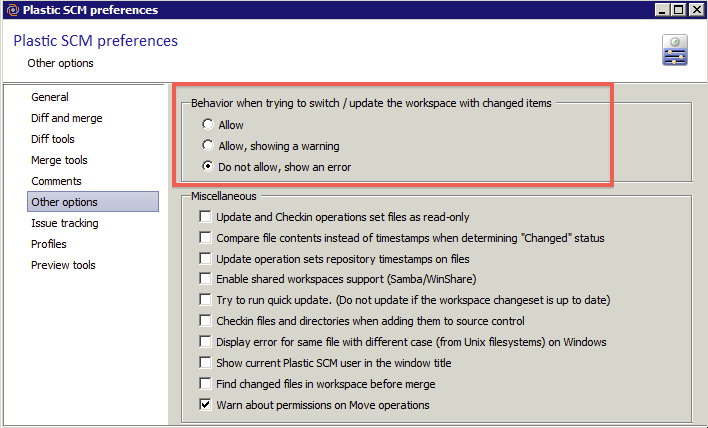 One of the options in Plastic SCM “Preferences” is allow (or not allow) to switch /update a workspace that it contains changed items. This option has been moved from “guiclient.conf” file (GUI configuration) to “client.conf” (common configuration). This value will be upgraded the first time that Plastic SCM 4.1.10.397 is loaded. The server stats logging was failing in some concurrency scenarios, for example when the call user wasn’t set yet. Fixed! There was a stack overflow exception when the main branch has a long history. The changeset number was cut when drawing the vertical layout. Hope you enjoy our new release! !